Broccolini arrived this week, which I plan to boil in salty water until it just yields, and then toss lovingly with olive oil and Pecorino. There are a multitude of baby lettuces to consider, not to mention the asparagus I will barely roast and toss with lemon juice or egg yolk. And what about radishes? They should be sliced thinly and strewn across buttery toast, sprinkled with sea salt…. It’s a good time to be a cook. This is also the best time of year for eggs. Happy chickens eat new spring grasses and herbs, and their eggs are more tasty and nutritious for it. If you’ve ever thought of switching from supermarket eggs to farmer’s market eggs, spring is the time to do it. So now you see, I had both eggs and spring onions on the brain when this recipe started coming together. 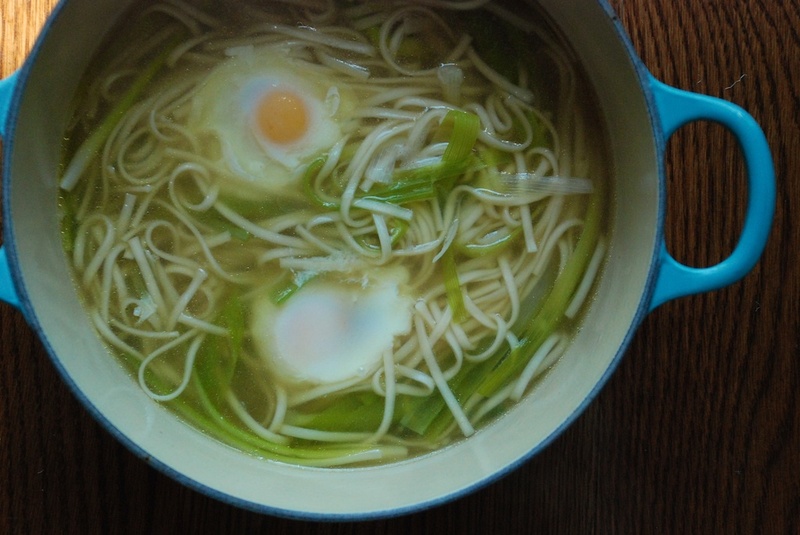 I wanted to do a play on a ramen noodle soup, with ribboned scallions acting as a kind of second noodle. The aromatic additions lend a faintly Asiatic flavor profile. 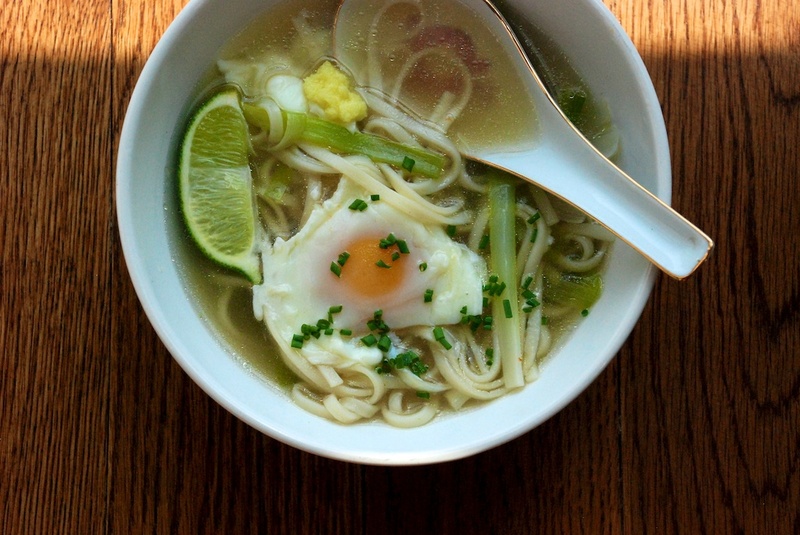 The broth is quite delicate, so that each ingredient is easily detected. 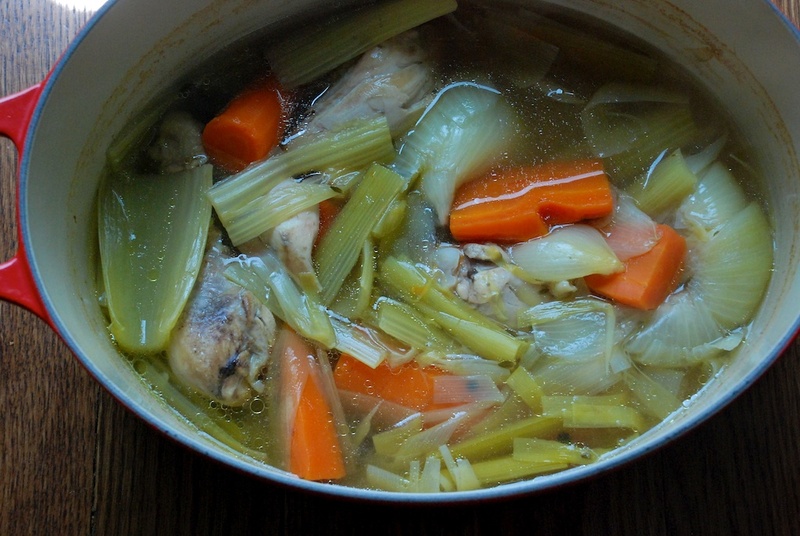 To me, this is a soup that tastes precisely of spring. 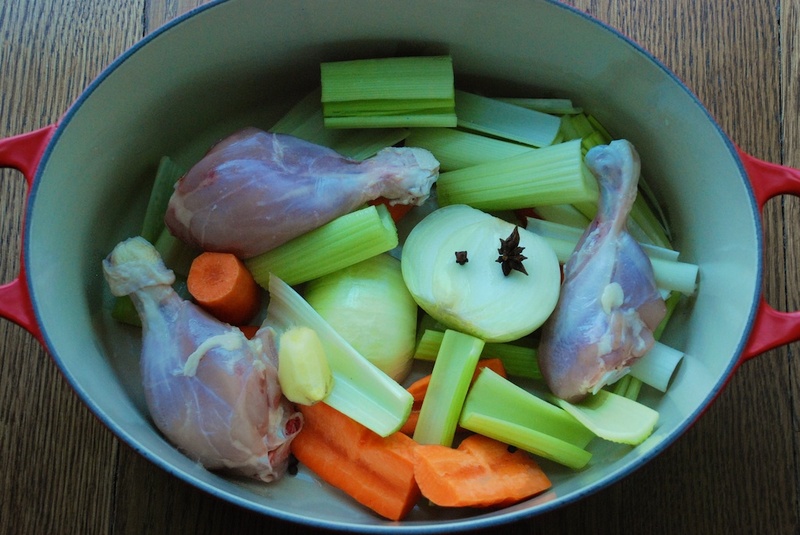 Start with three drumsticks. Pull off most of the skin, using kitchen shears if that’s easier, and then add them all to a big pot. Peel and halve both carrots, and throw those in too. 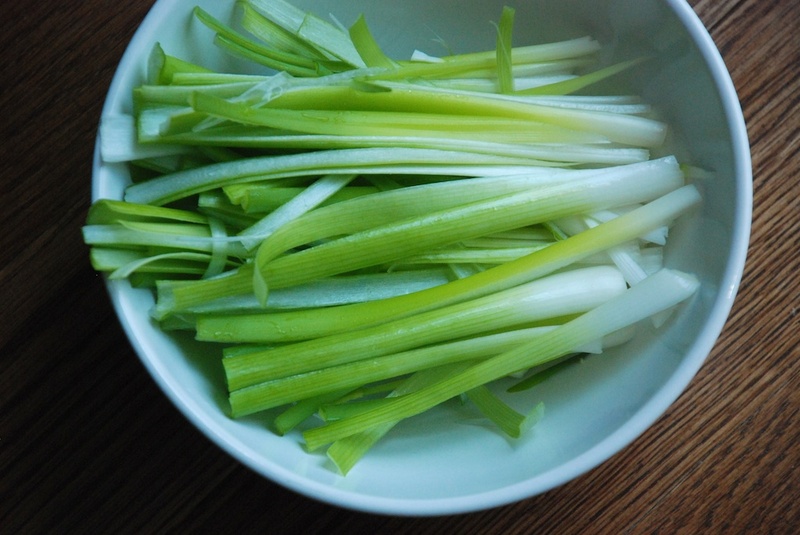 Wash and roughly chop the celery, halve the onion, clean and chop the leek, and toss those into the pot too. Let the butter soften slightly, and then put it in a bowl. 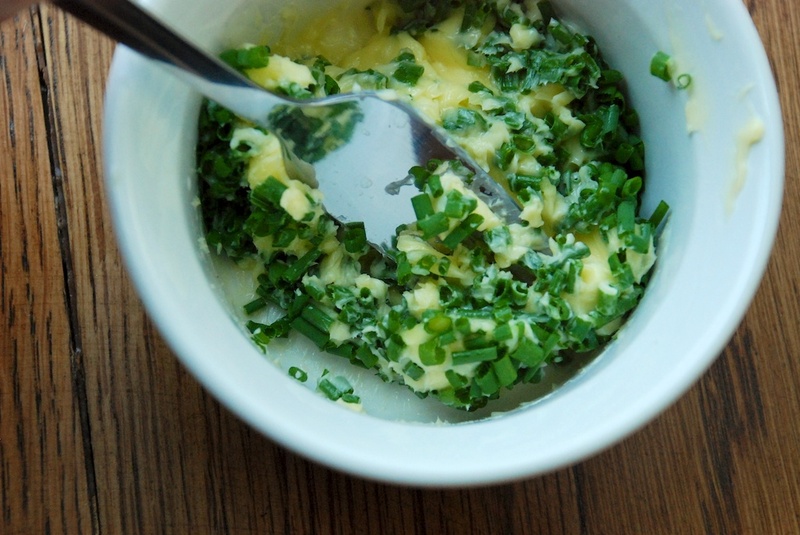 Snip up most of the chives, and add them to the bowl. 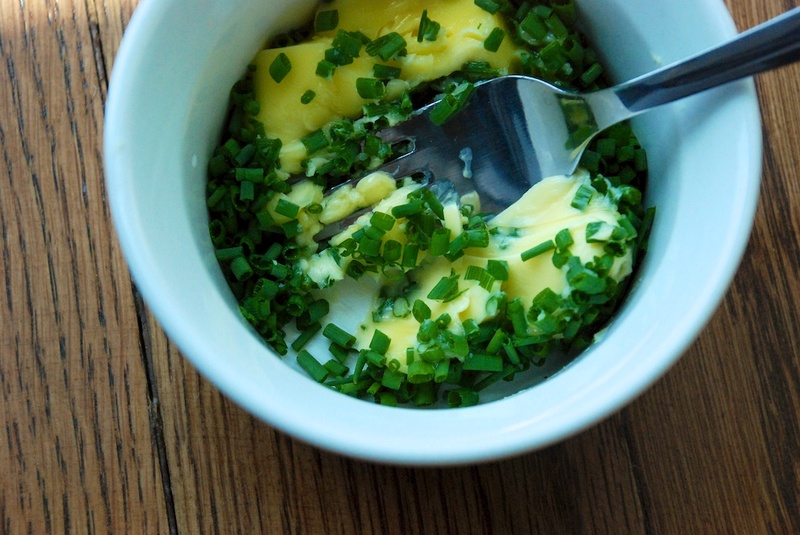 Mash the butter and chives together with a fork. If you will be eating soon, you can keep the bowl out. Otherwise, cover and refrigerate it. 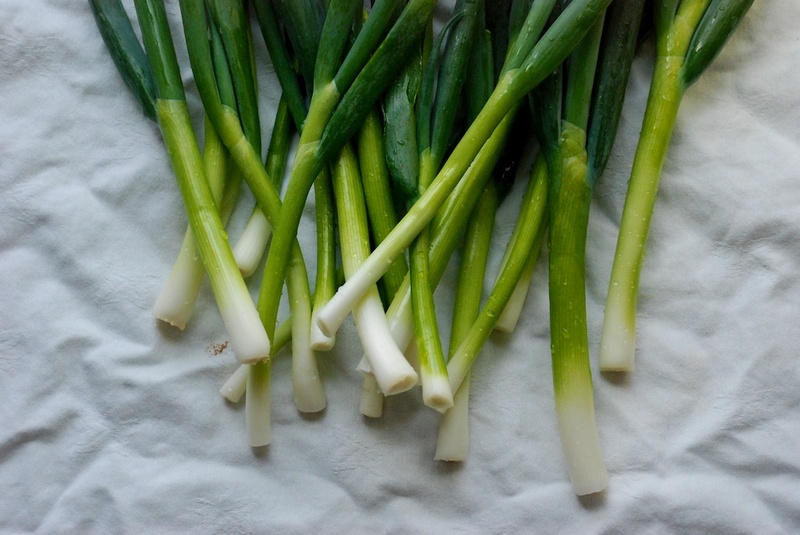 Wash and dry the scallions. Cut the whites twice lengthwise, in a cross, and then cut crosswise to separate them from the greens. 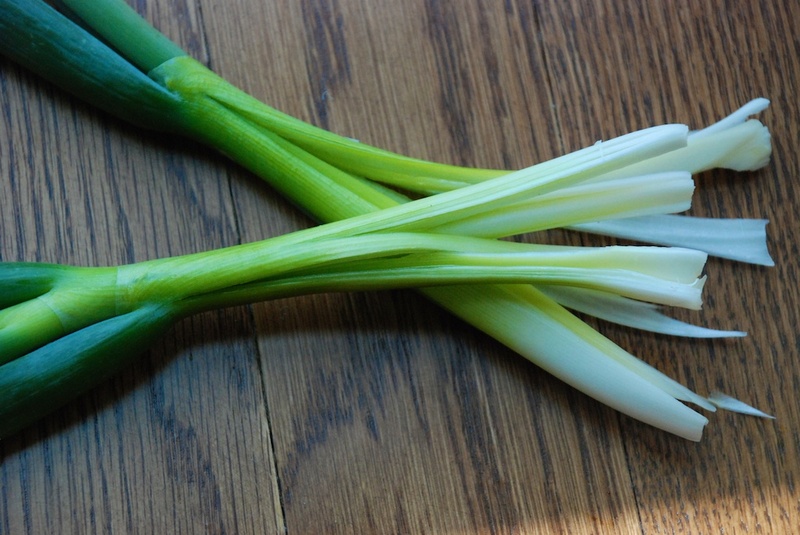 (Basically, you want to cut each scallion into ribbons.) Set aside. Meanwhile, boil a separate pot of water. When the water reaches a boil, cook the Udon noodles based on the package instructions. Drain the noodles and set them aside. Set a medium fire under the pot of broth. Add the scallion ribbons and simmer the soup for about 5 minutes, or until the scallions are soft and lose a little of their oniony edge. Add the Udon noodles to the pot of broth. Just before you are ready to eat, add the four eggs to the soup, dropping one into each quadrant of the pot, so they don’t touch as they cook. This is easy poaching! 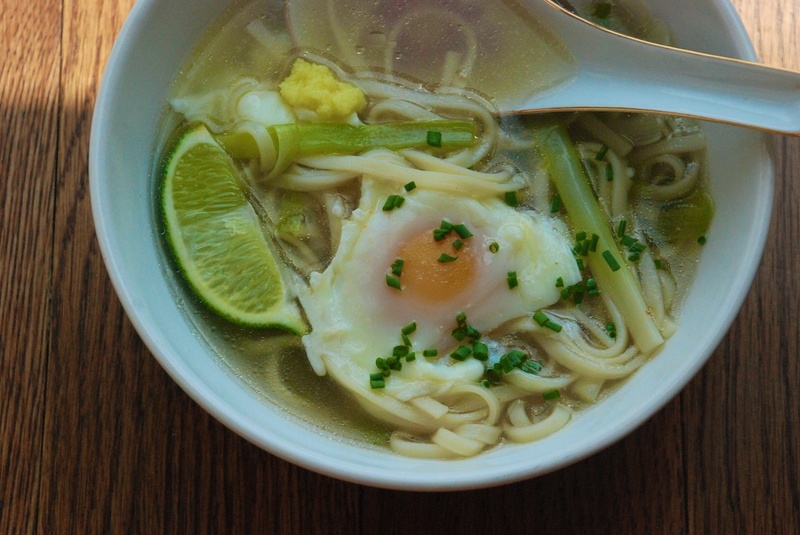 The noodles and scallions should keep the eggs in place. Cover the pot with a lid, and let the eggs cook for about 4 minutes, or until the whites are set. Run the remaining ginger through a mircroplane grater. Cut the lime into four slices. Snip up the remaining chives. 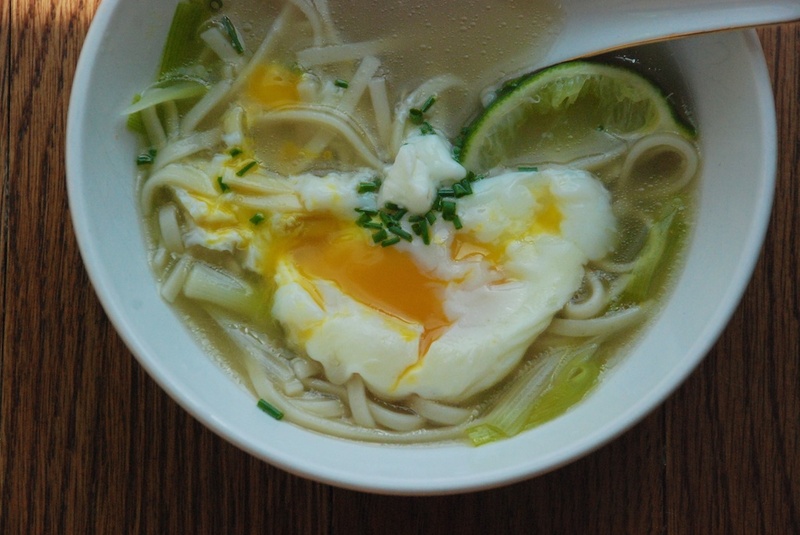 Empty the soup into individual bowls, spooning one egg into each bowl. 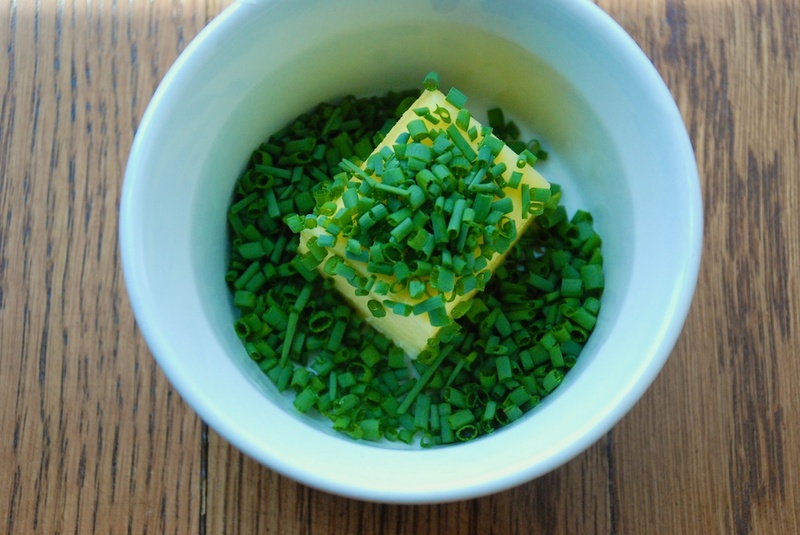 Garnish with the ginger, lime and chives. 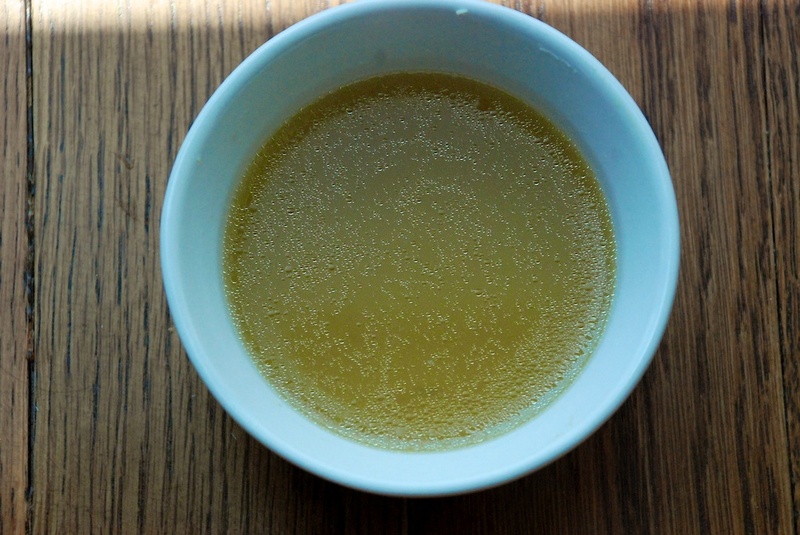 Swipe the chive butter onto the Pane Siciliano (toasted or not, whatever you prefer) and serve it with the soup.